This fact sheet is intended to help Navigators identify what issues are unique to consumers with Intellectual Disability so that they can assist them as they make decisions related to their healthcare coverage. Q1. What do I need to know about Intellectual Disability (ID)? A. There are over 7 million people with ID1 in the US. ID can be caused by any condition that impairs development of the brain before birth, during birth, or in the childhood years. Several hundred causes have been discovered, but in about one-third of the people with the condition, the cause remains unknown. Three major known causes of intellectual disability are Down syndrome, Fetal Alcohol Spectrum Disorder (FASD), and Fragile X syndrome. There are also other conditions that frequently co-occur with ID, such as autism spectrum disorder (ASD), cerebral palsy (CP), attention deficit hyperactivity disorder (ADHD), seizures, and mental illness. ID covers a wide range of impairment. Many people with ID read and write, make decisions, use telephones and computers, are employed, maintain relationships, live in their own homes, and recreate and worship in their communities. Others may need significant supports to participate fully in their communities. Unfortunately, however, people with ID continue to face discrimination and oppression, ranging from exclusion to targeted victimization. Such experiences contribute to secondary disabilities such as depression, anxiety, and obesity. Q2. What type of health care providers does someone with ID need to have access to? A. Like all people, the health needs of a person with ID can vary greatly based upon his/her physical and mental health and people with ID do not necessarily have ongoing health problems. However, priority health care needs include primary care, habilitative and rehabilitative services and devices, durable medical equipment, mental health and behavioral services, chronic disease management, cardio-vascular care, geriatric care, and dental and vision care. Therefore, critical providers include primary care physicians, physical and occupational therapists, orthopedists, psychologists, psychiatrists, social workers, cardiologists, geriatricians, dentists, orthodontists, and ophthalmologists, among others. Learn about health considerations and recommendations for persons with specific types of ID here. Q3. What are some of the prescription needs that someone with ID may have? A. While prescription needs vary by individual, people with ID may be more likely to need prescription medications to address seizures, depression, anxiety, muscle spasms, cardio-vascular problems, gastro-intestinal problems, and complications resulting from diabetes. People with ID may also need assistance in managing their medications; understanding when and how to take them; knowing what to do if a dose is missed; knowing how to get refills; and understanding the importance of following instructions. Some may need even more assistance with taking and handling prescription medications. Learn about prescription medications at Fact Sheet #5. Q4. What type of therapies (physical, occupational, speech, etc.) and/or devices (durable, disposable, etc) would someone with ID potentially require? A. People with ID frequently require a variety of therapies including physical, occupational, behavioral, and speech therapies depending on the individual. Also, because of more commonly co-occurring health and mobility problems than in the general population, people with ID may use a variety of health care devices including wheelchairs, prosthetics, and orthotics, in addition to home modifications such as ramps, lifts, and grab bars. Some may also require specialized nutritional supplements, feeding tubes, and incontinence supplies. Q5. What other services and supports, which are not generally medically arranged therapies and devices, are typically required by persons with ID? Are these arranged and financed in some private health insurance plans or in some Medicaid programs? A. Habilitation services, which many private health insurance plans have not traditionally provided, can be particularly helpful to people with ID who need therapies and other health services to acquire and maintain skills. Fortunately, health plans available through the Marketplace must offer habilitation services and devices as essential health benefits. how to reliably report how they are feeling. Currently, private health insurance outside of the Marketplace may limit the availability of habilitation services and some may refuse services that they view as habilitation. A few states, however, have mandates that require habilitation services for children. People with ID also frequently need long-term services and supports. These fall into two general categories: 1) activities of daily living (ADLs) and 2) instrumental activities of daily living (IADLs). ADLs involve caring for and moving the body, such as walking, bathing, dressing, toileting, brushing teeth, and eating. IADLs include cooking, using the telephone or computer, shopping, keeping track of finances, and managing medication. People with ID often need assistance with IADLs due to their cognitive disability. Medicaid is overwhelmingly the largest provider of long-term services and supports, including habilitation services. In 2012, Medicaid provided health coverage for 67 million low-income Americans, including 11 million persons with disabilities, according to Congressional Budget Office estimates. Q6. Are there any other unique medical needs that someone with intellectual disability should consider when evaluating a health plan? A. It depends on the individual and whether he/she has additional health concerns or disabilities that may need to be taken into account. Q7. Are there any type of accommodations I should consider when I’m planning to meet with someone with intellectual disability? A. People with ID may have difficulty with complex or abstract information. Therefore, you should use simple language, concrete terms, and give clear examples. For example, “oral health” should be described as problems with your mouth, such as when your teeth hurt. Similarly, a podiatrist should be described as a doctor that helps you with your feet. You should also avoid “yes/no” questions, such as “do you understand the difference between these two plans?” It is better to say, “How would you say these two plans are different?” to verify that the person truly understands the difference. Information should also be made available in writing so that the person can reinforce his or her understanding after a consultation. 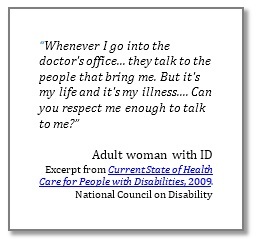 Most people with ID can and do make their own decisions, including those that relate to health care. Under the law, people are presumed to be mentally competent unless a court has declared them incompetent. Therefore, you should assume that the person with ID has the right to make his or her own health care decisions unless you are informed that he/she has been declared incompetent. The courts appoint guardians (also called conservators in some states) to make decisions for people who are declared incompetent. However, even individuals who have guardians should be included and empowered to the extent possible in their health-care choices. An alternative approach, supported decision making, is a favored emerging approach in the disability community. 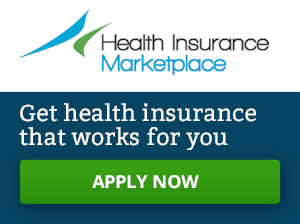 health care for adults with intellectual and developmental disabilities here & here. working with people with disabilities here. Q8. Are there any resources you would recommend to obtain additional information about intellectual disability? People with ID are those with “significant limitations both in intellectual functioning and in adaptive behavior as expressed in conceptual, social, and practical adaptive skills. This disability originates before age 18”. American Association on Intellectual and Developmental Disabilities (AAIDD), Intellectual Disability: Definition, Classification, and Systems of Supports (Schalock et al., 2010) and the Diagnostic and Statistical Manual of Mental Disorders, 5th Edition (DSM-5), published by the American Psychiatric Association (APA, 2013). Most states require that persons with ID have IQ scores at or below 70 to qualify for public services. Corbin S., Holder M., Engstrom K. Changing Attitudes, Changing the World: The Health and Health Care of People with Intellectual Disabilities, Washington, DC: Special Olympics International; 2005.